Today I'm sharing a garden-themed anniversary card I created for a two-fold purpose. It's not just for any anniversary, but for my sister and her husband's 14th anniversary! Happy Anniversary, Amy and Mike! So that was purpose #1. Not long ago I was asked if I'd like to make a sample card for an exciting, brand-new card challenge. Of course, I said I'd love to, and that was purpose #2 for this card! That new challenge? It's called the DeNami Addict Challenge and it debuts today. The first challenge is to create a project with a garden theme. How easy is that? Lots of room for interpretation I'd say, right? It was definitely the perfect theme for creating an elegant card to congratulate my sister and brother-in-law. And I'm betting there are plenty of upcoming occasions that you could make a garden-themed card for, too. I hope you'll try to play along! 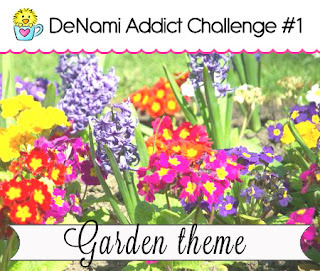 The requirements are easy--just make something with a garden theme and enter it over at the Confessions of a DeNami Addict blog. That's it! You can use any stamps and products you'd like, too. No restrictions! The prize is a $15 DeNami gift certificate. Isn't that awesome? So if you love the look of DeNami Design stamps, but don't have any yet, this is the perfect opportunity to win some and finally start your collection! Of course, if you are already addicted to DeNami stamps, then this is a wonderful way to continue to feed that addiction! DeNami Addict Challenges will run monthly, starting on the second Monday each month. This first challenge will end on June 11 at 11:59 p.m. CDT. You can find all the details about this new challenge, and see some more great garden-themed cards contributed by some of the other DeNami DT gals, over on the DeNami Addict blog. I know you'll love playing along! Very pretty Emily! Love the colors and the ribbon! I'll have to check out the new challenge blog! Your garden card is so pretty! I love all the swirls. Gardens and flowers are always good for inspiration. Now if only mine would grow! Happy Anniversary to your sister and brother-in-law! I like the theme of swirly flourishes, in the stamp, the flower, the ribbon, even the bracked punching. Heck, that sentiment even has some swirly flourishes to it! Wow, Emily! I totally love the colors you went with and it's layed out perfectly! Gorgeous card, gf!! Congrats to your sister and her husband!! Ooh, your card is beautiful. I love the vine images. Another challenge, huh? Wish I could play in all of them. Actually, I haven't made many recently...no time to do all the linking and looking for them. Whew! That is really bad, isn't it? Hope you had a spectacular Mother's Day. What a pretty card.. I am sure your sister is going to love it..
How pretty Emily, they'll love this for sure!! Hi Emily! The anniversary card for your sis and her husband is so Gorgeous!! Such a pretty design and I love the lovely colours and the elegant sentiment. I'm sure they will be thrilled to receive this. Very soft and oh so pretty! Simply sweet, beautiful and lovely card! !